My new piece Point Cloud, for guitar sextet or guitar soloist w/ tape, is starting to receive performances by the members of its commissioning consortium. On Friday, consortium organizer Dan Lippel (International Contemporary Ensemble, New Focus Recordings) performed the piece in Brooklyn (Spectrum) for the Brink Guitar Festival. I’m very excited for our recording, which I engineered, mixed and produced, to come out this year on Dan’s new record with New Focus. I’m also working with Dan on a project engineering and mixing Serenades (by the Dutch composer Peter Adriaansz), to be released on the same album. Another member of the consortium, Colin Davin, is performing Point Cloud for the Cleveland International Classical Guitar Festival on June 6th, at Cleveland Institute of Music’s beautiful Mixon Hall. This will be a heavily contrapuntal program, with music by Bach (Violin Sonata no. 3 & Violin Partita no. 2) and Steve Reich (Electric Counterpoint). Since Point Cloud was conceived as a musical reaction to Electric Counterpoint, it will be exciting to hear the two paired together for the first time! I also feel very close to the Partitas and Sonatas, having practiced them myself extensively. Colin is one of the best guitarists in the country, so if you’re in the general area of Cleveland please consider attending. I’m also happy to announce I’ll be working on a new percussion quartet with Dr. Jeff Crowell (no relation that we know of!) at the University of Wisconsin, Eau Claire. This will be a consortium commissioning project, so any interested parties should please get in touch to learn more about this opportunity! As anyone who has followed my work over the years knows, I’ve composed A LOT of percussion music; it’s a space that allows me to experiment with new rhythmic concepts and methods of composition. I expect that this project will be no different, and I’m excited to get started. In other news - Jeff Stern, Peabody professor and member of the fantastic ensemble Icarus Quartet, recently performed Celestial Sphere at Mount St. Mary’s University. Rochester based fivebyfive ensemble is performing Waiting in the Rain For Snow at the Rochester Academy of Medicine, and a piece by Caleb Burhans (A Moment for Jason Molina) that I engineered, mixed and produced (as well as playing a bit of guitar on) was recently released on Cantaloupe Records and featured on NPR. There are lots of exciting things happening in the next month and a half! First up, Simon Jermyn and I are appearing on George Grella’s Brooklyn Rail podcast bright and early Monday morning to discuss our debut record as Spirit Spout. We are both really proud of this music and look forward to speaking with George, whose work for the Rail is deeply knowledgeable and insightful (check out this piece to see what I mean). Later in the week, sjDANCEco is presenting new choreography for my string quartet The Open Road, at the California Theater in San Jose (with members of the San Jose Chamber Orchestra performing). I can’t wait to see what they come up with, and hope to eventually have some video footage to share! Then Sandbox Percussion is performing Music for Percussion Quartet at the Hunter Museum of Art in Chattanooga. Sandbox has been performing this piece consistently for several years now, and in May we made a recording with Lawson White at Good Child Studios. It sounds great and can’t wait for it to come out! Next up, I’m traveling to Boston where percussionists John Tyree and Christopher Gunnell have organized a full program of my chamber music at the Boston Conservatory. John and Chris also commissioned a new piece for percussion and electronics to premiere at the concert, Saiga, which you can listen to below. Then right after I get back to Brooklyn, Empyrean Atlas is performing at So Percussion’s music series Brooklyn Bound, hosted at their working studio in the Navy Yards. We are sharing the bill with two other fantastic artists, Charmaine Lee and Kaoru Watanabe. We’re honored to be performing on this series. A few days later, guitarist extraordinaire Dan Lippel of the International Contemporary Ensemble and New Focus Recordings is presenting the first performance of my new piece for guitars, Point Cloud, at Spectrum in Brooklyn. I’m very pleased to announce the release of Spirit Spout, my collaboration with Simon Jermyn, out today on Chris Speed’s label Skirl Records. We’ve been working on this record off and on for the last three years, and it features Jim Black, Iarla O’Lionaird, Linda Buckley, Gideon Crevoshay, Joe Branciforte & Jason Nazary. I also produced and mixed this album. Just got through an exciting couple weeks recording two new pieces, Point Cloud (w/ Dan Lippel) and Catharsis (w/ New Morse Code). Point Cloud will be included on Dan's new double(!) solo record on New Focus Recordings early next year, which also features a recording of Steve Reich's Electric Counterpoint. Reich has given his blessing and encouragement to this unique interpretation, which includes guitar preparations as well as ornamentations based on the original material. As a long time admirer of Steve's music, it's meaningful for my music to be included alongside his, especially since Point Cloud is a tribute of sorts to the lush textures, rhythmic richness, and layered guitars of Electric Counterpoint. I also have to say that Dan is an absolute monster guitar player and I can't wait to share what we've recorded together. Like Point Cloud, Catharsis is the result of a consortium commission. Mike Compitello from New Morse Code wrote this nice piece about our history working together and the process of community building through consortium commissions. We had an amazing week rehearsing at Avaloch Farm and recording at the unparalleled Guilford Sound in Vermont. As you might gather from the title, Catharsis is an emotional outpouring, traversing an expansive range of soft, lyrical playing to some crazy rhythmic twists and turns. Mike and Hannah are the best of the best, and it was exciting to hear the piece come alive as we worked through it together. The recording we made will be really great. I'm not positive yet when this music will be coming out, but I do know that New Morse Code is gathering lots of new rep as we speak, so it won't be too long. Until then, feast your ears on their last record Simplicity Itself. Next up for me - lots of mixing! I'll be working on these two pieces as well as finishing up Music For Percussion Quartet, which I recorded with Sandbox Percussion back in May, and will be coming out next year on Coviello Classics. Dan Lippel recording Point Cloud at Oktaven. Mike Compitello getting ready to rock at Guilford Sound in Vermont. Unfortunately missing in the photo is the amazing Hannah Collins on cello. There is a new Empyrean Atlas site - check it out here! And for those who may have missed it, our newest record came out last November, receiving positive acclaim from the New York Times, WNYC's New Sounds, Textura and more. The debut album from Spirit Spout, my collaboration with bassist/guitarist Simon Jermyn, is coming out this fall on Skirl Records. This record features our compositions and playing, along with guests Jim Black, Iarla O'Lionaird, Gideon Crevoshay, Linda Buckley & Joe Branciforte. I produced and mixed this record, as well as engineering most of it. See below for two preview tracks. About to head in for Day 2 at Good Child Studios (with the amazing Lawson White! ), recording my piece Music for Percussion Quartet with Sandbox Percussion. This piece requires an incredible range of musicianship - movements 1 & 3 are full of complex polyrhythmic twists and tricky compound melodies, while 2 & 4 are slow and haunting, comprised entirely of bowed vibraphones and marimbas. Sandbox has been performing the piece consistently for the last several years and have completely mastered the technical and emotional components of the music. They are one of the best percussion groups I've heard and I'm honored to be working with them! This recording will be part of their album coming out on the German label Coviello Classics, also featuring the amazing music of L.A. based composer Thomas Kotcheff. Music for Percussion Quartet draws inspiration from the radically different environments I've lived in and experienced while traveling. More specifically, the music represents my current home of Brooklyn, and my former home state of Alaska. The 1st and 3rd movements, Fluctuation and Oscillation, both utilize polyrhythms throughout. Parts are interconnected, even as the clarity of their relationships blur and shift back into focus. The energy, drive and creative inspiration of living in New York City is imprinted on these sections. Sky and Landscape (2 & 4), on the other hand, come from the meditative calm of open, pure environments. The spacious nature of these movements suggests a place for contemplation, quiet spaces in the mind for reflection. In Alaska, I have experienced this kind of perspective most vividly when climbing mountains, looking up at the sky and out on to the landscape. Another very cool composing project coming up - a new work for electric and classical guitar commissioned by Dan Lippel, Mak Grgic, Colin Davin, Giacomo Fiore, Ken Meyer, Nicholas Ciraldo, Devin Sherman & Patrick Sutton! Honored to be working with such an incredible group of musicians on this music. The piece will be a musical response to one of the most iconic pieces in the modern guitar repertoire - Electric Counterpoint, by Steve Reich. While I've always loved Pat Metheny's classic recording on Elektra/Nonesuch, Dan Lippel (of International Contemporary Ensemble and New Focus Recordings) recently made a beautiful recording that casts an entirely different light on the music. Highly recommended listening. Very excited to announce a new consortium commissioning project with the amazing New Morse Code! NMC is a percussion + cello duo that recently released their debut album Simplicity Itself on New Focus Recordings. I've known percussionist Mike Compitello ever since we went to the Bang on a Can summer festival together 10 years ago, and am very much looking forward to working again with him, Hannah, and all the members of this project to create a new piece for cello, percussion and electronics. Please visit HERE for more info on the project and on how to get involved as a consortium member. And see below for NMC's beautiful performance of Boris Kerner by Caroline Shaw. I'm starting on a new piece for percussion and electronics, commissioned by John Tyree and Christopher Gunnell. It will premiere at the Boston Conservatory in the fall, as part of a full concert of my music there. Very excited for this. Two other commissioning projects are also in progress, and will be announced soon. Excited for these as well! Empyrean Atlas is performing at the 2018 Composers Now Festival February 6th at Littlefield in Brooklyn. We are helping the Knells celebrate their new record! Also with Bombay Rickey. Check out the Gig Alert from New Sounds! The new Empyrean Atlas album has been popping up on various Spotify playlists, including the The Playlist from the New York Times, WNYC's New Sounds, and most recently Wilco Recommends! Check out Poly Rush on Spotify, and listen/buy on Bandcamp. 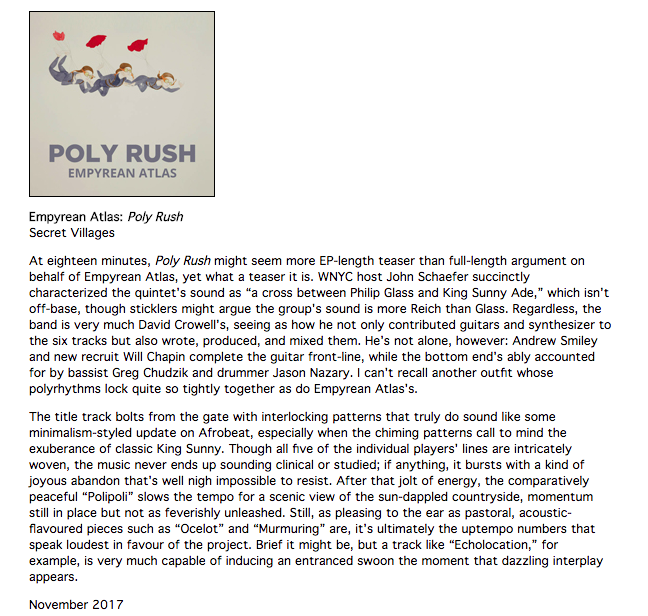 Beautiful review for Poly Rush / Empyrean Atlas in from Textura! See below or read directly at Textura. Empyrean Atlas is featured this week in the New York Times Pop Music Critics Playlist of best new songs of the week, alongside music by Feist, Bruce Springsteen, Sam Smith, Brian Blade and others! Incredibly insightful description of our music. You can listen to the full playlist here, or find it on Spotify. New Empyrean Atlas album out today!! Stream below from Bandcamp. "These two outfits have strayed a long, long way from their classical chamber-music roots, and are better and bolder for their ventures. Empyrean Atlas offers bright, peppy Afrobeat-flavored jump-up, while ensemble, et al. (recently written up on National Sawdust Log) favors lush, moody percussion-forward post-rock. Both have new albums you'll want to hear." New Empyrean Atlas album out November 3rd! Poly Rush explores the beauty and intimacy of acoustic music alongside the energy and power of electric instruments. Polyrhythms are the answer, except when simple, unison guitar lines will do. Poly Rush is when the rhythm of a song makes you feel particularly alive. Polipoli chronicles an epic journey through the upcountry of Maui, 4-wheel driving on twisting one lane roads, honking through the fog at every turn. Similarly, Echolocation is in search of an interesting environmental experience - a different kind of music echoing and bouncing its way through the underwater landscape. The source of the title Ocelot shall remain mysterious, although we will say it is related to Nethermead. Murmuring is that magical thing starlings do. Human beings do a similar thing with music; it’s just not something you can see. Empyrean Atlas welcomes Will Chapin to the band. He’s doing really well. This is also the first Empyrean Atlas record fully produced and mixed by David Crowell. I’m producing, mixing and composing/co-composing a new album with the great electric bassist and guitarist, Simon Jermyn. We are using this long term studio project as a vehicle to explore new textures and sounds in connection with our diverse backgrounds in new music, improvisation, art rock and ambient music. In addition, we’ll have some very special guests on this record, including the legendary Jim Black on drums. I’ve admired Jim’s playing for about 15 years now, and he has played and recorded with many of the most important musicians of the last 20 years. More soon on this music as it develops. Jim Black at Figure 8, with recording engineer Michael Coleman. Very excited that my music will be performed at EMPAC for the Albany Symphony's annual American Music Festival, on June 3rd, by Sandbox Percussion. "The American Music Festival is a bold, five-day festival of innovative concerts and artistic happenings across Troy, NY. Experience thrilling new works by living American composers and cross-genre artists. Witness for yourself how the Albany Symphony and Grammy-winning Maestro David Alan Miller are reshaping the nation’s musical future!" NOW Ensemble will be performing the piece I wrote for them, Waiting in the Rain For Snow, a lot in the next month. The first concert is this Sunday, April 30th, for the Carnegie Hall Neighborhood Concerts series at Our Saviors Atonement Lutheran Church in Washington Heights. Following that are 2 performances in California; May 2nd at University of California, Riverside, and May 9th at the San Diego Museum of Art. Then on June 1st-3rd, NOW Ensemble is collaborating on a very exciting new project called MINOR FALL/MAJOR LIFT with the Malashock Dance Company in San Diego. John Malashock has choreographed a new piece to classic pieces from the NOW Ensemble repertoire, including Waiting in the Rain For Snow. See below for more info! MINOR FALL/MAJOR LIFT is a bi-coastal collaboration of live music and dance, featuring all-new choreography by iconic San Diego Choreographer John Malashock and co-produced with Art of Élan. The performance is set to stirring new music by composers affiliated with New Amsterdam Records (Brooklyn, NY), played live by the world-renowned NOW Ensemble (New York) – Art of Élan’s Ensemble-in-Residence for 2017. The program will consist of five new interconnected choreographic works that explore the theme of ‘change’ and our reactions to it, set to music by four different composers, including a commissioned score by Judd Greenstein, who is the founding Co-Director of New Amsterdam Records and is a Composer-in-Residence with NOW Ensemble. The other composers are Mark Dancigers, David Crowell, and Patrick Burke. Sandbox Percussion played my piece Music For Percussion Quartet twice this week, for two great events! First was March 30th at Brooklyn Bound, a monthly series hosted by the influential and groundbreaking So Percussion. This is where you go to hear the latest in innovative percussion music (and not always percussion music) in the informal loft setting of So Percussion's Brooklyn studio. And more formally, National Sawdust hosted the all day 2nd annual Percussion Festival on Saturday, April 1st. See the picture below of Sandbox in action! Tonight on New Sounds from WNYC - two of my compositions! Empyrean Atlas performing Redwood and Ian Rosenbaum performing Celestial Sphere. OKAPIS debut EP is out now! OKAPIS is an open ended exploration of sound. The process remains mysterious. Okapis have exceptionally large, rotating ears with which to hear noise, and are infrasonic. OKAPIS is where different sound worlds co-exist. Okapis are solitary and live only in the dense forests of the Congo. Ian Rosenbaum's new solo album is officially out today on VIA records. I composed, produced, recorded and mixed Celestial Sphere. You can watch a beautiful video below by Michael McQuilken. Celestial Sphere is an astronomical concept of observation that projects all images to be of equal distance from a single vantage point. While no astronomy expert, this concept immediately had emotional resonance for me as I was writing the music. Particularly in the first section (approximately the first 6 minutes of the piece), the listener feels as if they are right in the middle of the music, as parts swirl around them; at first in the extreme Left/Right speakers, and then with additional parts entering closer to the center of the panning spectrum. Creating a full auditory sphere enveloping the ears, the music feels strongly three dimensional. Adding to this spherical effect, each part is performed at multiple tempos. Since they move at two different (although closely related) tempos, the faster eventually laps the slower, like a faster runner would a slower runner at the track. Celestial Sphere was commissioned by a consortium of 12 percussionists, organized by Ian David Rosenbaum. He presented the initial premiere on the People Inside Electronics Series at The Monk Space in Los Angeles in November 2013. There have been some exciting events recently with Sandbox Percussion performing my new percussion quartet in California (L.A. and Sacramento) and New York. I was able to attend the performance at the Sacramento Festival for New American Music and also gave a composer lecture/masterclass at Sacramento State. In New York, the performance at Dominique Levy Gallery was celebrating a new exhibition by renowned sculptor Joel Shapiro. The entire performance was filmed for later release, so stay tuned. On November 18th, Ian Rosenbaum celebrated the release of his CD (officially out January 6th on VIA records) at National Sawdust in Brooklyn. I composed, mixed and produced Celestial Sphere, a work that was commissioned by Ian and a consortium of 11 other percussionists and appears on the new record. I also mixed Tawnie Olson's lovely piece Meadowlark. I'm leaving for Central Asia in a few days to participate in Playing Together: Celebrating U.S.-Central Asian Collaboration. I’ll be there as a performer, composer and lecturer for a touring band celebrating the 25th anniversary of the creation of the independent Central Asian states. Week long workshop and concert in Almaty (Kazakhstan), followed by a tour in Ashgabat (Turkmenistan), Astana (Kazakhstan), Tashkent (Uzbekistan), Bishkek (Kyrgyzstan) and Dushanbe (Tajikistan). Very excited to see this part of the world and perform with all the great musicians involved! Also, in the past few weeks there have been some great performances of my music in South Carolina (FretX performing Pacific Coast Highway) and Philadelphia (Ian Rosenbaum performing Celestial Sphere). Very interesting article up on New Music Box by Patrick Zimmerli, curator of the Intersect Series in Bryant Park. He cites my piece Music for Percussion Quartet, performed for the series by Sandbox Percussion, as way to talk about the philosophical aims of booking a series in a busy urban environment like Midtown Manhattan. Just got back from an inspiring week in Hudson with Found Sound Nation, working with the kids at Kite's Nest on writing and producing new tracks! And currently hard at work mixing the new Empyrean Atlas album. We recorded at beautiful Figure 8 studios in Brooklyn earlier this month, and I'm very excited for people to hear our new music. This time around I took on the full producing reins - record should be ready to go by October and out in the world soon after. I'm excited for Sandbox Percussion to perform my new piece Music for Percussion Quartet for the Intersect series tonight at Bryant Park. Check it out! In a few days, I'm heading back to South Korea with the Philip Glass Ensemble for 4 performances of La Belle et la Bete - we were also there back in October for Einstein on the Beach. This time we'll be in Seoul and the coastal city of Tongyeong. While I'm gone, Sandbox Percussion will be performing my new piece Music for Percussion Quartet at the Phillips Collection in D.C. This is the 2nd time my music has been performed at the Phillips Collection - and while I wish I could see it, I am about to head to the Sandbox studio in Brooklyn to hear a full run through! Very excited for that. Another notable performance coming up is Duo Montagnard at the Symphony Space in New York - they'll be performing a new commissioned piece, meander, on April 15th. About to head to Switzerland (Geneva!) for the first time to perform Koyaanisqatsi with the Philip Glass Ensemble. The Philip Glass Ensemble is traveling to Houston in a few days to perform at Free Press Houston, a massive two day music and art festival featuring Kendrick Lamar, Flying Lotus, New Order, and many others! Tonight, the University of Tennessee Percussion Ensemble premieres Music for Percussion Quartet, a consortium commission with 5 university programs and Brooklyn's own Sandbox Percussion. Very excited about working with all these groups on future performances! UT Percussion will also be performing the piece in a few weeks at PASIC. Also, Simon Jermyn is traveling later this month to Europe (London, Northern Ireland & Dublin) to premiere a newly commissioned piece for multiple electric guitars and basses! Big thanks to Wilco, for choosing the latest Empyrean Atlas record, Inner Circle, as one of 17 new records to buy. Check out the announcement here. And make sure to listen to their beautiful new record, Star Wars. Patrick Brennan, from the magazine Arteidolia, recently wrote an extended article on the music of Empyrean Atlas, and much more. Very interesting read - check it out here. And Empyrean Atlas has our first show since March, returning to the Silent Barn with Voice Coils and Stern. 7/24 at 8pm. Empyrean Atlas is excited to play with one of our favorite bands, Buke and Gase, on 3/25, at the Gavin Brown Enterprise (291 Grand St). This performance is in conjunction with a new exhibition on Christopher Knowles, visual artist, and most widely known for his contributions to the libretto of Einstein on the Beach. 8pm. Mid-March through mid-April there will be a number of performances of my music, including my Asian premiere, in Seoul, South Korea. 3/15 - Francisco Perez performs Celestial Sphere, for multiple marimbas, in Lexington. 3/25 - Sandbox Percussion performs Point Reyes at Cornell University. 3/28 - The FiveOne Experimental Orchestra premieres a newly commissioned work, Like a Machine, in Cleveland. 4/2 - Mak Grgic and Dan Lippel perform my guitar duo Pacific Coast Highway for the Outside the Box Festival, University of Southern Illinois. 4/7 - Northern Illinois University performs my percussion sextet, the Day After. 4/11-12 - Mak Grgic performs Pacific Coast Highway in Seoul, South Korea. 4/12 - Sandbox Percussion performs Point Reyes at Concerts on the Slope, Brooklyn. I've just started work on a new piece for electric guitar & electric bass, commissioned by the Dublin based Improvised Music Company for Simon Jermyn, with support from the Irish Government. There will be performances in New York, London, Dublin and Northern Ireland in November 2015. Also very excited to announce a new commissioning consortium for percussion quartet, organized by Andy Bliss and the University of Tennessee Percussion Ensemble. This will be an extended work, 15-25 minutes, with movements that can also be performed separately. If your university program or percussion quartet is interested in getting involved, please visit the website for more details. Audio of percussion and non-percussion works are available to stream. In a week I'll be leaving for a tour with the Philip Glass Ensemble in France, with 4 concerts in Paris and 1 in Chalons-en-Champagne. While I'm gone, the FiveOne Experimental Orchestra will be performing Waiting in the Rain For Snow on 2/13 in Cleveland. This will be their 2nd performance of this piece, and they will also be performing a new work they commissioned from me next month, on 3/28. Yesterday we recorded a live performance/interview with host John Schaefer that will air on WNYC's New Sounds, December 10th, 11pm. Check it out here! Also yesterday, Sandbox Percussion performed an arrangement for percussion quartet of my piece Point Reyes at Bard College. And today, Furman University Percussion Ensemble gives their 2nd performance of a new arrangement of Celestial Sphere. And last, but certainly not least, Empyrean Atlas has its CD release show at Silent Barn this Thursday, the 11th. Playing with Battle Trance and Very Feeling. Don't miss it! And stream the new record, Inner Circle, HERE. The new Empyrean Atlas record is out today! Check it out here. Tonight Empyrean Atlas plays at Glasslands for the Cellar and Point's CD release party. Also with the Knells - check it out! Empyrean Atlas will be appearing on the BRIC B-Side series October 30th, at 7:30pm. BRIC is a leading promoter and producer of independent music in Brooklyn, including the Celebrate Brooklyn concert series in Prospect Park. You can watch live on on Time Warner 756, Verizon Fios 46, Cablevision 70, or stream live here. Full performance and selected clips will also be available on BRIC's B-Side page after the show. In other exciting Empyrean Atlas news: our new album, Inner Circle, will be released on 12/2/14, followed by a CD release show on 12/11 at Silent Barn with Battle Trance and Very Feeling. Coming up in a few days some of my music, including Celestial Sphere will be featured on the Pas de Calais show for New York Fashion Week. Then coming up a week later (Sept. 9-11th) are the highly anticipated Philip Glass/Steve Reich concerts at BAM. We'll be performing pieces from our Retrospective Program, with Steve Reich joining us to perform Music in Similar Motion on the 10th and 11th. Later in the month Ian Rosenbaum will be performing my work Celestial Sphere on tour in Miami, Orlando and Atlanta. Check out Empyrean Atlas on WNYC's New Sounds! Also make sure to come to our next show, with Christopher Tignor and the Knells, August 16th at Subculture. June 22nd is the day of exciting events for the month. In the morning I'll be making a video for Empyrean Atlas with director Eli Rarey and choreographer/producer Katherine Fisher. Then I'm performing Hoketus with the Bang on a Can All Stars on the Marathon. Louis Andriessen will be in New York for the performance. Then we'll be joining Meredith Monk for Panda Chant II, which looks really fun. Video interview with Empyrean Atlas on the I Care If You Listen blog. Empyrean Atlas has a new website. Hello from Berlin, where the Philip Glass Ensemble is performing the last run of Einstein on the Beach. Coming up on 3/24 at Roulette, Empyrean Atlas is playing a show with Victoire, Build & itsnotyouitsme. Event listing is here. Hope to see you there! The Philip Glass Ensemble is performing Einstein on the Beach at the Theatre du Chatelet, in Paris, from 1/7-12. Then we're going to St. Etienne and Blagnac for performances of La Belle et la Bete and our 40 year Retrospective program. And then a final stop in Gothenburg, Sweden, for a performance of Koyaanisqatsi with orchestra and chorus. At some point during the month, I'll be finalizing the mixes of the new Empyrean Atlas record (courtesy of Ryan Ferreira). We have a big night at Roulette on 3/24, mark your calendars. Build, itsnotyouitsme and a special guest band will be joining us. More on that later! On December 8th and 9th, Empyrean Atlas will be recording our second album, with engineer Bryce Goggin! Grey Mcmurray will be helping Ryan Ferreira and myself produce the record. I'm really excited about the new music we've been working on and can't wait to share it. Plans for a CD release party and some other album related projects are in the works. The recording of my new multiple marimba percussion piece Celestial Sphere, performed by the supremely awesome Ian Rosenbaum, is done. I produced, engineered and mixed this recording. Big thanks to Lawson White at Good Child Music Studios (for use of his room) and the 12 members of the consortium who helped commission the piece, and who will be doing premieres all over the country this season! Ian kicks things off with a performance at the People Inside Electronics festival in Los Angeles, and will also perform it at the Phillips Collection in Washington D.C. on 3/23. Empyrean Atlas was featured in the latest issue of I care if you listen's magazine. Download the app and check out the video! In other news, I've recently been making some forays into the commercial world -- here's a vignette for GANT Rugger, in collaboration with Kings County Distillery. You can hear the full track here (coming home (2)), along with a collection of other short, improvised guitar pieces. Check out the piece I wrote for Alarm Will Sound last year. This is a live performance from July 2012 in Columbia, Missouri. I'm also composing a new piece for SPARK, a great ensemble from Germany whose last record, Folk Tunes, was released on Deutsche Grammophon. They will record and perform the new piece throughout Europe, Asia and the U.S.
Also finishing up writing music for the new Empyrean Atlas record. You can hear all that music 8/29 at 7 Dunham in Williamsburg. New video for Empyrean Atlas, recorded at the Navy Yards for the Living Room Series (created by Shimmy Boyle and produced by Kate Fisher). Tonight is the premiere of a new piece, wind up bird, commissioned by the Arts at the Park Festival. Composed for Mak Grgic (electric guitar) and Paul Vasile (baroque organ). Previewed at Sequenza21. A recording of hashimoto, a new piece for 3 flutes (premiered at Weill Hall on 2/13/13), is posted here. Featuring Andrew Sterman, my colleague in the Philip Glass Ensemble, performing all the parts. Composed, recorded, mixed & produced by yours truly. Empyrean Atlas is playing for the Radio Zero series at Sycamore, on 3/25. Our new record, released last month, is here. Hello from Hong Kong, just got here to perform Einstein on the Beach! Empyrean Atlas is doing a house show this Friday at 10 Clermont in Brooklyn, for the new Living Room Series. It will also double as a live music video shoot. 9pm start! Excited to announce that I'm now on the Serious Music Media roster (along with Michael Gordon, Toby Twining, Michael Harrison, Alarm Will Sound & many other amazing composers and ensembles). Check them out! Empyrean Atlas record is out! Next show on 2/22 at 7 Dunham, it's a showcase for Nonesuch Records. Exciting month of music making. I'll be in L.A. on the 10th to hear the JACK Quartet and Mak Grgic premiere my new piece, as the crow flies. This was commissioned by the Da Camera Society. Then on the 13th my new piece for 3 flutes, hashimoto, is being performed at Weill Hall (at Carnegie Hall) for the A4TY Program at Bloomingdale School of Music. And finally, my band Empyrean Atlas is doing a show on the 22nd in Williamsburg at 7 Dunham w/ Julia Easterlin, Tony Castles and Conrad Winslow. Our new CD will be available (starting on 2/19), so it's kind of like an undercover CD release party too. Hope you can make it. Preview a track from the forthcoming Empyrean Atlas album (Feb 2013) on I Care If You Listen's 2012 Winter Mixtape. A busy couple months ahead! Working on a several commissions over the next few months, including a piece for 3 flutes that will premiere at Carnegie Hall (Weill) and new music for electric guitar and organ performed by Mak Grgic and Paul Vasile (Arts at the Park Festival). Just finished the new piece for the JACK Quartet and Mak Grgic, commissioned by the Da Camera Society and premiering in L.A. on 2/10/13. Very excited to hear it! Leading up to then, the Philip Glass Ensemble will be touring in London, Amsterdam, Groningen and Ghent to play Koyaanisqatsi, Einstein on the Beach and La Belle et la Bete. I also just created a new multimedia page to highlight some of the collaborations I've done in the past year. It's always inspiring to work with artists in other fields, and with some potential new projects percolating I'm looking forward to doing more of it! There is an exciting show coming up at the HERE Arts Center (NYC ) on November 19th. The cast of Einstein on the Beach will be presenting their own music/dance/film, and my band Empyrean Atlas will be closing the show! Show starts at 8:30 and we'll be on around 10.